Laguna Woods is the Southern California’s premier active lifestyle community for people 55 and older. It's easy to embrace the Village's countless activities, services, amenities and social opportunities. Our 18,500 residents enjoy endless opportunities to explore, connect and live life to the fullest in this picturesque South County community. The Laguna Woods mission to improve lives and strengthen the community is fueled by people and organizations who bring passion, expertise and resources needed to get things done. Consider giving some of your time and talent to create lasting solutions that improve life for everyone. 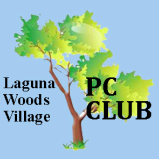 Become a PC Club Volunteer. Many roles do not require technical expertise. Greeters to answer questions and provide assistance in the PC Workshop. Supervisor with some computer experience to answer questions and provide assistance in the PC Workshop. Technicians to assist with hardware and/or software maintenance.